Tequila from Stoli Group draws fans including NBA All-Star, Amar’e Stoudemire, HBO actor Sarunas Jackson and Sports Illustrated Swimsuit Model Vita Sidorkina. NEW YORK–(BUSINESS WIRE)–Cenote™ Tequila, dubbed the “tequila with a soul” and the latest spirit introduced by Stoli Group, held its launch party on Wednesday night in Miami. Wynwood art gallery, The M Building, was transformed into an indoor immersive brand experience that opened to an outdoor Yucatan jungle scene with international DJ’s, Charles Schillings, and twins, The S Brothers, entertaining the crowd into the early hours of the morning. The eclectic guest list included: NBA All-Star, Amar’e Stoudemire, HBO Insecure actor, Sarunas Jackson, Sports Illustrated swimsuit model, Vita Sidorkina, Miami model, Isabela Rangel Grutman, and Emmy Award-winning chef, James Tahhan. Attendees were greeted with the premiere of a Denis Lagrange short film set deep in the Cenotes of the Yucatan, starring Fernando Stalla, seven-time Standup Paddling champion, and Marina Kazankova, free-diving world record holder. They were then invited to taste the Blanco, Reposado and Añejo expressions neat and paired with a range of Mayan chocolates while watching a video on the handcrafted production of Cenote Tequila. Cenote Blanco comes with a suggested retail price of $44.99. Cenote Reposado has an SRP of $54.99. Cenote Anejo has an SRP of $64.99. Explore “tequila with a soul” at www.tequilacenote.com or by following @CenoteTequila on Instagram, Facebook or Twitter. Part of SPI Group – one of the world’s leading premium spirits businesses – Stoli Group was established in 2013 as the division responsible for the management, distribution and marketing of SPI’s global spirit portfolio. Previous articleCigar & Spirits 8th Annual Tasting Event (Newport Beach). 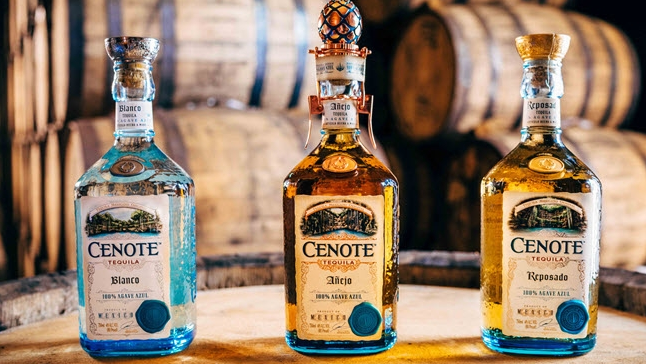 Next articleStoli Group Launches Super-Premium Cenote Blanco, Añejo and Reposado Tequila Aged in Bourbon Barrels. (Distillery Trail).